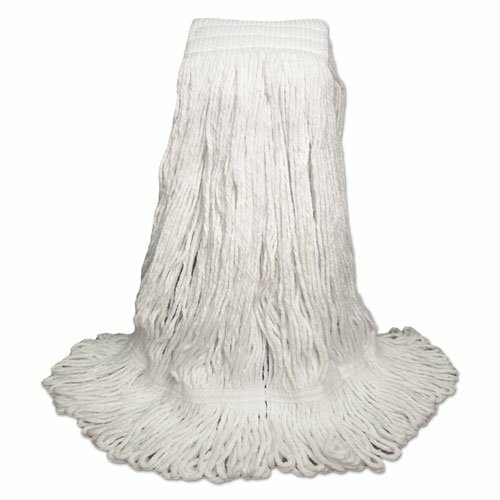 Standard four-ply natural yarn mop head. Looped end design lints less, reduces fraying and unraveling. Durable double-sewn tailband prevents tangles and provides more floor coverage. Heavy-duty, five-inch vinyl mesh headband securely holds full-weight premium fiber strands. Use with clamp-style or gripper-style mop handle (sold separately). Head Type: Wet Mop; Application: Floor Maintenance; Mop Head Style: Looped End; Mop Head Size: 24 oz. Includes 12 mop heads per case. Standard four-ply natural yarn head. Looped end design lints less, reduces fraying and unraveling. Heavy-duty, five-inch vinyl mesh headband securely holds full-weight premium fiber strands.